Using WP Plugin "Header Footer Code Manager"
Install and activate the plugin and follow the instructions to add a new code snippet. This is a more secure way to add the snippet without having to edit your theme's functions file and it will never be lost with theme updates. 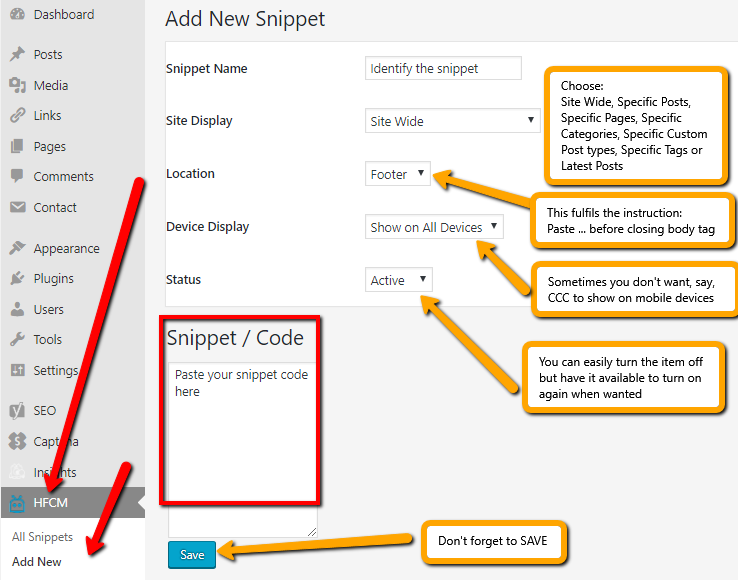 Another benefit is that when you add the snippet, the plugin creates a shortcode too which can then be placed directly onto a page or post WITHOUT having to switch to the text editor. If you are using a page builder that allows adding code, it may be advisable to add the code through the page builder as well as/instead of the plugin. Without Using the Plugin - NOT Recommended! Note: Make sure you do NOT insert the snippet into any of the existing WP system files such as footer.php or header.php etc as that would put it on EVERY page in your blog - It just needs to go on the one page/post you want it on.